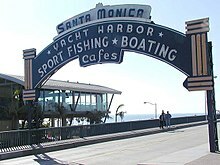 Santa Monica is a stron ceity locatit in wastern Los Angeles County , California, USA, bi the Pacific Ocean, sooth o Pacific Palisades an Brentwood, wast o Westwood, Los Angeles, an north o Venice. Hit is named for Saunt Monica o Hippo. Santa Monica is kent for haein a fair feck o Breetish an Erse Indwallers, whilk accoonts for the numerous pubs in the ceity, an breetish shops whilk inbrings onie thing fae Irn-Bru tae Imperial Leather. Ane o thae shops is Tudor House. Wikimedia Commons haes media relatit tae Santa Monica, California.